Hillphoenix, a pioneer in designing environmentally sustainable refrigeration systems, has earned the 2015-16 Store Certification Excellence award from the U.S. Environmental Protection Agency’s GreenChill Program. This award recognizes the manufacturer of commercial systems that has installed more advanced refrigeration systems in GreenChill-certified stores than any other partnering manufacturer in the past year. “Hillphoenix continues to be an industry leader with an innovative spirit that is providing supermarkets and food retail with economic and environmental benefits,” said Tom Land, manager of EPA’s GreenChill program. Hillphoenix, a pioneer in designing environmentally sustainable refrigeration systems, has earned the 2015-16 Store Certification Excellence award from the U.S. Environmental Protection Agency’s GreenChill Program. This award recognizes the manufacturer of commercial systems that has installed more advanced refrigeration systems in GreenChill-certified stores than any other partnering manufacturer in the past year. Hillphoenix systems were installed in 95 GreenChill certified stores over the past year. This is Hillphoenix’s sixth GreenChill Achievement Award since the program launched in 2007. 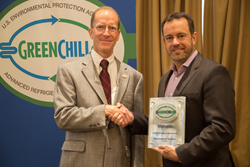 “This recognition from EPA’s GreenChill Program is an honor. It demonstrates our commitment to advancing sustainable technologies through our research, development and manufacturing processes. It also reflects our commitment to collaborating with customers on the competitive and environmental advantages of investing in sustainable refrigeration systems,” said Eduardo Navarro, vice president and general manager of Hillphoenix Systems Division. Navarro accepted the award for the company at the FMI Energy & Store Development Conference in New Orleans. About a third of systems shipped by Hillphoenix use Second Nature natural refrigerants. Hillphoenix’s improvements in alternative refrigerants and energy efficiency have helped remove over 2.5 billion pounds of harmful emissions in the last two decades. EPA’s GreenChill Partnership works with supermarkets to reduce refrigerant emissions and decrease their impact on the ozone layer and climate change. The partnership helps supermarkets move to environmentally friendlier refrigerants; reduce harmful refrigerant emissions; and adopt greener refrigeration technologies and best practices. About 11,000 GreenChill Partner stores operate in the U.S. Learn more at epa.gov/greenchill.